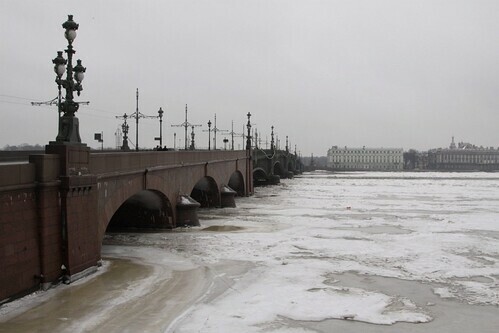 The Russian city of Saint Petersburg is a located across a collection of islands, divided by the Neva River, and reconnected by a series of movable bridges that allow boats to head upriver. So how do electric trains, trams and trolleybuses make their way across? 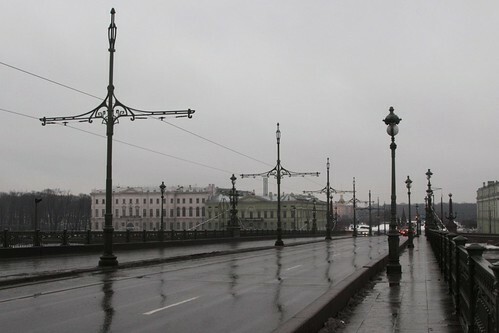 In central Saint Petersburg the bridges are low to the River Neva, and have multiple spans. 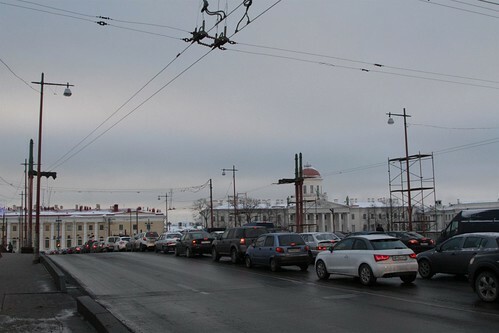 Some bridges have trolleybus routes passing over them, requiring a pair of wires per lane. 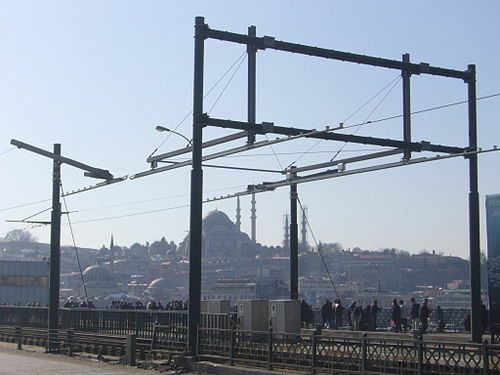 While other bridges have tram tracks, which only have a single wire. In both cases, the overhead wires are terminated at the edge of the opening bridge. 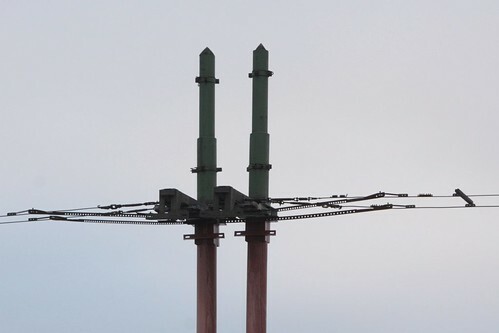 A small air gap remains for the trolley pole or pantograph to cross. While at the pivoting end, a small hinge allows the fixed and movable sections of overhead to move separately. 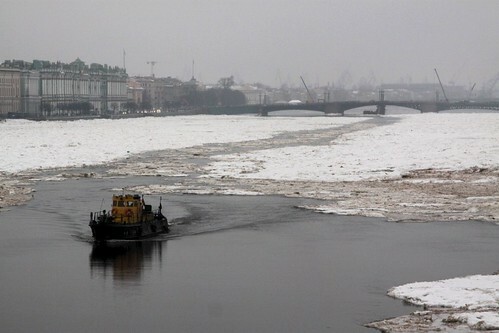 Similar techniques are used at the Finland Railway Bridge that carries trains across the Neva River. It consists of two parallel double tracks bridges – the older bridge having a twin-leaf bascule span, the second a single span vertical-lift span. There are plenty more European bridges where trams and trains cross movable bridges, with the Galata Bridge in Istanbul, Turkey being my first find. 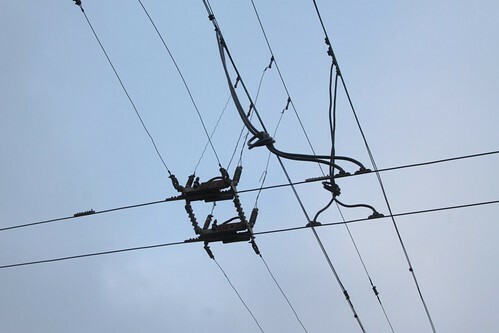 Overhead lines aren’t an issue at all – metal structures either side of the opening span provides a secure location for the overhead wires to be terminated. 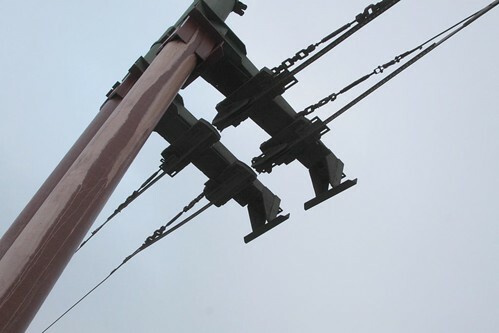 Trams cross the gap without any trouble, with the pantograph following the solid metal bars either side of the air gap. The Netherlands also have a number of tramways crossing movable bridges – the Kattensloot Bridge in Amsterdam is one, and the Erasmus Bridge in Rotterdam is another. And not quite a tram, but I found a photo of this rolling lift railway bridge over the Hunte river in Oldenburg, Germany – again, overhead wires are no problem. I’m sure there are plenty more examples of electrified railways and tramways crossing movable bridges to be found across the world. This entry was posted in Trains, Trams and tagged Germany, Netherlands, rail operations, railway electrification, Russia, Saint Petersburg, Turkey. Bookmark the permalink. On the very last pic of the St.Petersburg trolley overhead lines caption, the switching shack next to the river bridge near Oldenburg, Germany, ironically reads “Bruecke”, meaning nothing else but “Bridge”. So that nobody can miss it…..